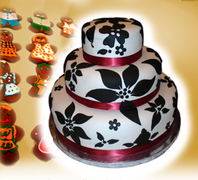 Dream Bakery offers a wonderful selection of delectable and lovely custom bridal and groom cakes. For the dessert table we have a delicious variety of pastries and cookies. For bridal luncheons and showers, bachelor and bachelorette parties we offer custom cakes, cookies and savory and sweet pastries. Beautiful, custom cake at a reasonable price. Owner easy to work with. Excellent taste! If your reception is downtown, Dream Bakery is a little out of the way, but it is so worth it. The cake was both delicious and beautiful. We also had the particular desire to find a bakery that could make a sugar-free cake option for a hypoglycemic bride, and Dream Bakery was one of the only places we found. Although the wedding cake was made with sugar, they also make a fabulous Splenda carrot cake or cheesecake.